"The level [of] threat in Belgium has been raised to 4 (maximum alert) with special emphasis on transport hubs, airports, stations, and nuclear plants," Prime Minister Charles Michel said Tuesday. The U.S. Embassy in Brussels issued an alert to American citizens there following the blasts, recommending they shelter in place and avoid all public transportation. "The U.S. Embassy reminds U.S. citizens that Belgium is at a threat rating of Level 4, or ‘serious and imminent attack,'" the alert read. "Such events can take place with little or no notice; therefore U.S. citizens are urged to be aware of local events, follow local authority instructions, monitor local media further developments and, take the appropriate steps to bolster your personal security." The attacks occurred just days after authorities in Brussels captured Salah Abdeslam, a suspect in the Paris terror attacks that killed 130 people last November. Both France and Belgium warned citizens of the threat of further terror activities following Abdeslam’s capture Friday. Hours after the attacks, possible images emerged of the suspected attackers, according to Belgian news outlets. While there was initially no claim of responsibility for the attacks, Reuters reported later that ISIS, the terror group that said it was behind the Paris attacks, had claimed responsibility for the blasts. Supporters of ISIS have also reportedly celebrated the bloodshed on social media. President Obama, currently in Cuba, has been briefed on the situation in Brussels, the White House said, according to the Associated Press. Secretary of State John Kerry also spoke with the Belgian foreign minister by phone from Cuba. The United States is working "to determine the status of all American citizens in Brussels," Kerry said in a statement. The State Department is also looking into unconfirmed reports that three or more Americans may have been wounded in the blasts. 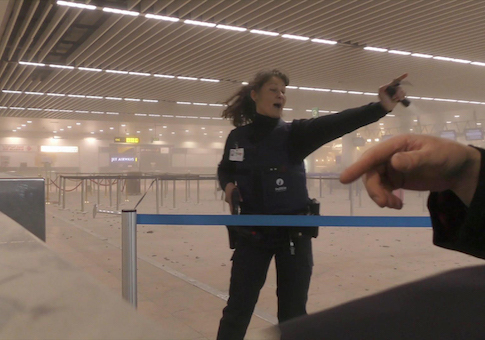 Later, NBC News reported that three Mormon missionaries from Utah were seriously injured in the explosions at Brussels Airport. Defense Secretary Ash Carter also said at the start of a House Armed Services Committee hearing Tuesday that the United States is working to account for American civilians and service members in Belgium, according to the Washington Post. Obama briefly addressed the terror attacks Tuesday during remarks from Cuba, saying that America stands in "solidarity" with Belgium. "We will do whatever is necessary to support our friend and ally, Belgium, in bringing to justice those who are responsible," Obama said. "This is yet another reminder that the world must unite. We must be together, regardless of nationality, or race, or faith, in fighting against the scourge of terrorism." The president devoted about 60 seconds to addressing the situation in Brussels before launching into prepared remarks about his historic visit to Cuba. Police presence in Washington, D.C., has been increased following the attacks in the Belgian capital.